Cancer surgeons from around the world have joined the SSO community to advance their knowledge and remain on the leading edge of research and science. 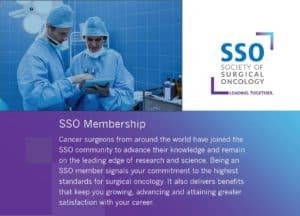 Being an SSO member signals your commitment to the highest standards for surgical oncology. It also delivers benefits that keep you growing, advancing and attaining greater satisfaction with your performance and your career. Commit to the SSO mission of improving multidisciplinary patient care by advancing the science, education and practice of cancer surgery worldwide and become a member today. 1A. Certification by the American Board of Surgery or an equivalent surgical specialty Board or membership in a recognized national or international surgical or surgical oncologic society. • Oncologic teaching or research. • Involvement in activities of the American Cancer Society. • Involvement in activities of the Commission on Cancer of the American College of Surgeons. • A leadership role in hospital or community cancer activities. • Authorship of publications on topics pertaining to Oncology in peer-reviewed medical journals. • Membership in other oncologic societies. 2. Non-Surgical Oncologists: Must be an acknowledged expert in a non-surgical field who has made significant contributions to Surgical Oncology or any scientist with a doctoral level degree, not in clinical practice, doing research in cancer or a cancer-related field. *Includes a subscription to the Society’s electronic journal, SSO News, and reduced annual meeting registration fees. • Must be an acknowledged expert in a non-surgical field who has made significant contributions to Surgical Oncology or any scientist with a doctoral level degree, not in clinical practice, doing research in cancer or a cancer-related field. Qualifications: Associate Membership in The Society shall be limited to any non-physician health care provider (e.g., nurse clinician, physician assistant) who is involved in surgical oncology patient care. 1. Rights: An Associate Member shall have the right to attend, participate in and submit abstracts for presentation at meetings of The Society. 2. Recommendations for Associate Membership: An applicant must be proposed for membership by either an Active or Senior Member in good standing, along with one seconder who must also be either an Active or Senior Member in good standing. *Includes subscription to the Society’s electronic journal, SSO News, and reduced annual meeting registration fees. 2. Must have completed their surgical training, but have not yet become Board-Certified. 3. If elected, the candidate member may remain in the Candidate Group for up to two (2) years post fellowship. After that time, the Candidate will advance to Active Membership. For 2 above, an applicant must submit a completed membership application along with a letter of recommendation from the training program director of the applicant’s career interest in oncology. A Candidate Member shall have the right to attend, participate in and submit abstracts for presentation at meetings of The Society, and the right to serve on a committee as appointed by the President of the Society. *Includes subscription to the Society’s electronic journal, SSO News, and reduced meeting registration fees. 2. Must be a student enrolled in an accredited medical school at a college or university. 3. If elected, the Resident Member will remain a Resident Member through completion of surgical training and then be required to apply for Candidate Membership. A Resident Member or Medical Student Member shall have the right to attend meetings of The Society.